Slotted waveguide arrays consist of a number of slots cut into the walls of a waveguide forming an array with the slots acting as individual radiating elements. The specific design task here is a 10-element transversal slot array cut into the upper wide side of a WR-51 standard rectangular waveguide. The operating frequency is the center of the K band, 8.5 GHz. Single slot model requires only 231 unknowns thanks to higher order MoM applied in WIPL-D Pro 3D EM Solver. The array model is built by using the single slot model and applying a single Copy operation to create the other 9 array elements. That model requires only 1149 unknowns. Single slot simulation lasts under a second on a standard desktop PC or any low-end laptop with dual or quad core CPU, while the array simulation lasts only a few seconds. Radome represents enclosure protecting usually a radar antenna. The radomes are designed in such manner that they minimally influence operating characteristics of the protected antenna. Ideally, radome should be transparent for the EM ways penetrating it. Radome and antenna are usually simulated as the inseparable components of antenna system. In this application note, demo model of the radome and the horn antenna are simulated in WIPL-D Pro, a full 3D EM Method-of-Moments based solver. The demonstration model of the radome represents model of monolithic radome used as a cover for simple circular horn antenna. 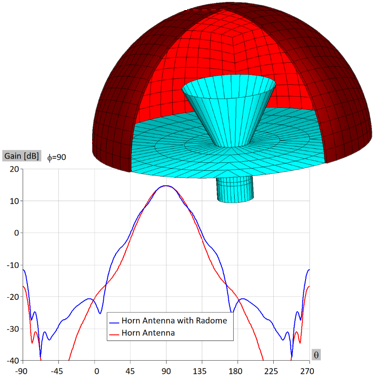 The main focus of this application note is to show how fast and accurate the horn antenna covered by radome can be simulated using WIPL-D software.The operation frequency is 9.5 GHz. Computer used for these simulations is standard desktop, with simulation time of just a couple of seconds. Presented results clearly show influence of dielectric applied within the electrically thin radome – only lower levels of the radiation pattern are significantly disturbed. 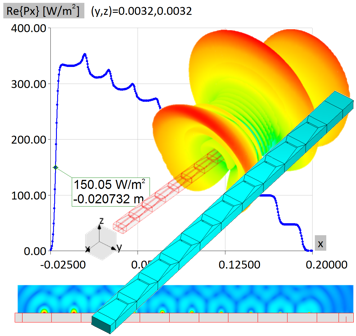 WIPL-D Pro offers easy parametric modelling and fast simulation of waveguide structures in general. Such purely metallic structures require very low number of unknowns. 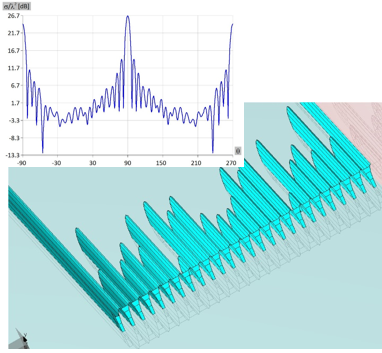 The abilities of the tool are demonstrated in this application note for simulation of the array antenna with large number of waveguide open-end elements. Owing to efficient modelling by using canonical BoR objects, simulations were carried by using very low number of unknowns. The hardware platform is every day work PC or laptop, without the need for using any expensive hardware. Usage of two symmetry planes yields simulation time in seconds per frequency point. 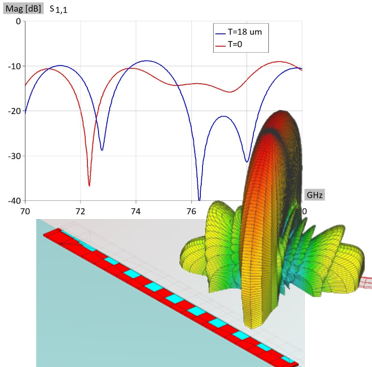 A detailed convergence study of the series-fed travelling wave patch array is shown. The simulations are performed at 77 GHz in the WIPL-D Software suite – a full 3D EM simulation tool based on the method-of-moments. Simulated travelling wave patch antenna array has 10 elements. The focus was to investigate the return loss of the array with absolute accuracy. In addition, the patch array is simulated with finite thickness metallization (18 um) which produces important effects at such high frequencies. The metallization thickness of the traveling wave patch array elements was introduced along with the feeding mechanism which emulates the realistic coaxial feeding. Owing to the efficient WIPL-D EM Software simulations, the entire simulation runs in under 10 seconds at regular desktop PC or laptop. This enables users of WIPL-D EM software to run numerous simulations and investigate important EM effects. The specific attribute of the array is high frequency (77 GHz) and modern real-life application of similar antenna array structures. At the end, WIPL-D Team successfully showed the series fed travelling wave patch array antenna beam squint by displaying the radiation pattern at the 3 selected frequencies.